Wedding day thoughts are always about you, the bride or your groom or the wedding party. 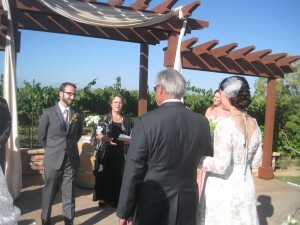 But as a wedding officiant, I notice that another very important person is the father of the bride, your dad. He can be found pacing around the venue, talking occasionally with friends or relatives. But mostly he is just “there” until it comes time for the walk down the aisle. Your dad is more nervous than you are. He has to “give away” his precious child. In Southern California we no longer use the words, “give away” in the wedding ceremony. The minister says, “Who presents this woman to be married to this man?” But he still remembers it as “giving away” his very own little girl. It’s a very poignant moment for him. No one ever sees him except the officiant. So I just wanted to add this to my blog. I wanted you to know in the middle of all the excitement on the day you are married, your dad needs a little TLC from you. He is so happy for you, his daughter. But placing your hand in the hand of your smiling groom is HUGE for him. When it comes time for that hug, make it the BEST ONE ever. He will know you understand and will love you more than ever. He is not just the father of the bride, he will ALWAYS BE YOUR DAD!